Many people balk at the thought of sitting down and drawing up a budget. It is commonly thought that financial planning is the preserve of big business and government, and that there is no real use for it in everyday life. However, given a bit of time and a fair amount of patience, a decent budget can work wonders for your personal financial situation. It might help to first look at exactly what a budget is. Essentially the process entails looking at your income and expenditure, and trying to balance the two. If your expenditure is greater than your income, then you will budget accordingly - that is, you will adjust your financial plan in order to reduce the deficit. 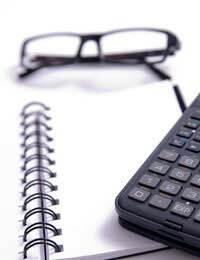 Setting out your budget on paper is a relatively simple task. First you need to look at your income. This incorporates any money which you are anticipating receiving over the period of your budget, which could be any length of time but is generally a year or six months. You should go through any sources of income you have and list them in descending order of value. Your wage will probably be at the top, perhaps followed by any bonuses you may accrue. You may also have incidental sources of income such as child benefit or interest payments on investments. Make sure you list them all, writing a description in the left-hand column, followed by the amount in the next column along. It is more useful to record net income (after tax) rather than gross, as otherwise you will have to perform unnecessary extra sums. Next comes the more difficult part: working out your expenditure. The same principle applies here, with the list being ordered from largest to smallest. At the top of the list will probably be mortgage or rental payments, perhaps followed by utilities. Expenses for which you have bills are the easiest to determine, as they tend to be regular and you will have a fairly accurate idea of how much they are. As with income, however, it is the incidentals which are more complicated to factor in. These might include such things as film rentals or going out. If you are a smoker, for example, you should work out how many packets you will buy over the period of your financial plan and determine the final cost. The most vital thing to bear in mind when budgeting is to be honest. The entire exercise is a waste of time unless you are prepared to be brutally frank with yourself. Your budget should be working for you, not the other way round, but the only way that you can draw up a useful financial plan is if it is accurate and true to life. Once you have completed both columns, add up the totals at the bottom of the page. It is fairly likely that the figure at the foot of the third column is the bigger of the two. If this is the case, don't panic. There are ways and means of plugging financial holes, which are explored another guide in this section, entitled Budgeting Your Way out of Debt. Always keep the key principle in mind when budgeting - that the idea is not to shame or depress you, but to help you towards an easier financial life. If you are honest with yourself, then a good financial plan can be a massive helping hand.